Very little is known about this obscure and rare computer. It was desgined by a Netherlands based company called NOXON AB, and was manufactured in Hong Kong by COMX WORLD OPERATIONS LIMITED. The keyboard is said to be waterproof (can someone test that for us ?) and used goldplated contacts under the keys (if you've got one, you are rich :-)). 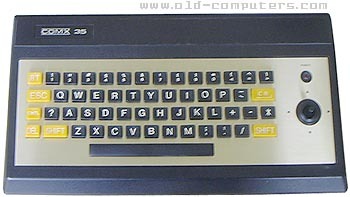 There is a built-in joystick to the right of the keyboard (very easy to break), a bit like on the Spectravideo SV-318. And just above it, is the power Led. A small thermal printer was available for the COMX 35. The chosen CPU, the RCA CPD-1802, was also used in the RCA Studio 2 videogame system and a development/hobby systems using Chip-8, like the Cosmac RCA VIP. This 8-bit processor is still being manufactured in many forms, as it is radiation-resistant. It was also used as the heart of the Voyager, Viking and Galileo probes ! The COMX-35 did have a successor: the COMX-PC1. This was just a COMX-35 in a different housing. Special thanks to Kin Wing Fung who donated us this computer ! see more COMX COMX 35 Ebay auctions !